By Michael Sebastian . Published on September 23, 2013. Publishing used to be a simple -- and very profitable -- business. Promise to reach a fairly defined audience each week, and advertisers fork over big bucks to put their ads in front of those readers. But with profits shrinking, the industry is getting more creative to attract marketers' dollars. And all anyone seems to want are sponsored posts. "There is a furor on the buy side," said Mike Perlis, CEO of Forbes. "The buyers are all asking for sponsored content." Marketers are projected to spend $1.9 billion on sponsored content this year, up 22% from 2012, according to eMarketer. By 2017, it predicts that number will reach $3.1 billion. Those dollars represent a bright spot in a largely bleak forecast. Spending on magazine and newspaper print ads is expected to contract to $32 billion in 2013 from $33 billion last year, eMarketer forecasts. For marketers, the appeal is simple: Audiences understand that advertisers have a commercial relationship with a publisher. By wrapping ad messages in a format that looks like editorial content—and calling them something else, such as "sponsored" or "partner" content—they hope to trade on the trust and goodwill editorial has built up with the audience. A bit of confusion is inherent in the appeal. It's a tricky trade-off. Publishers would like to see some of that $1.9 billion such ads bring in, but should be concerned about what advertising's encroachment means for their brands. Already ads have jumped from the right rail into news streams. So-called native ads commonly mimic headline and editorial styles and fonts. Some publications go so far as to enlist their writers to create sponsored posts for advertisers to ensure the right editorial tone is struck. BuzzFeed offers courses to media agencies on its particular brand of storytelling. The line between advertising and editorial is getting really blurry. Until there's a standard for what goes too far, publishers are leaning on their own version of the famous Supreme Court measure for obscenity: "I know it when I see it." Occasional blunders are inevitable since even the best gut instincts have off days -- and the ultimate risk is that such moves result in an outcome that's bad not just for publishers but marketers, too: jaded, distrusting consumers. One publishing executive says two or three advertiser requests for proposals come in every month that "don't feel right." They ask for ads that too closely resemble editorial content or place editorial content in an ad without clearly demarcating it as such. "They are asking for [more editorial control]," the exec added. One of the seven sponsored sections on Business Insider, the Future of Business, promises the site's take on the subject alongside posts from sponsor SAP. Editorial posts carry a label saying SAP sponsors the section, but don't explain that SAP has some control over the editorial product in the section. Michael Brenner, VP-marketing and content strategy at SAP, said his team suggests ideas to Business Insider's editorial directors, who create a list of potential topics and headlines for the section. SAP reviews that list and identifies the ones it thinks will make the "biggest impact in terms of readership and social shares," Mr. Brenner said. Business Insider writes and publishes the stories the site's editors think are best. Evan Spector, senior partner-associate director of print at Group M, said his clients, which are among the top 100 advertisers, don't want to mislead readers with sponsored content. But, he said, marketers want innovations that make their messages stand out. "It's our job to push the boundaries as far as we can, as long as we're not trying to deceive the reader," Mr. Spector said. Don't blame revenue-hungry media brands for the rise of sponsored content; it's part of a larger marketing trend. Media are no longer the gatekeepers to distribution and marketers have realized they can create and push messages to people on their own -- and when done well it's not only effective but more useful to consumers than traditional ads. As marketers shift budgets from traditional advertising to content marketing, publishers must try to grab some of those dollars. Increasingly they're realizing that while brands can create content, publishers still hold the biggest megaphone. Pure-play digital sites, such as BuzzFeed, Business Insider, Mashable and Gawker, have less to lose by relaxing publishing's traditionally strict standards than legacy media brands, according to Outsell media analyst Ken Doctor, because they have less of a reputation to uphold and advertising is their chief revenue stream. "Online-only companies, while they have a great advantage not having legacy costs, have a great disadvantage they don't have a built-in paid circulation business," he said. "They have to look for other ways." Brands like The New York Times and The Wall Street Journal risk alienating the readers who value their content enough to pay a premium for it, Mr. Doctor added. But even the old guard needs new revenue streams. The Wall Street Journal publishes three special sections underwritten by Deloitte -- Risk and Compliance, CIO Journal and CFO Journal -- where editorial stories by Journal reporters run alongside a box of content marked as sponsored. Deloitte has no influence over which editorial stories appear, a Wall Street Journal spokeswoman said. Advertising Age, for its part, runs sponsored posts; they're marked as such and the sponsor has no influence over Ad Age editorial content. And the Times looks poised to introduce sponsored content, despite its top editor, Jill Abramson, casting doubt on the idea earlier this year. In July it hired Meredith Kopit Levien, group publisher and chief revenue officer at Forbes, to fill the company's top ad post. She was an architect of BrandVoice, which allows marketers to publish directly to Forbes.com. That venture has attracted more than 30 sponsors since its launch in 2010 and, for the first time, helped digital revenue surpass print at Forbes in the first half of 2013. "We would never run any advertising that could be mistaken for editorial content," a Times spokeswoman said in an email, "but we are exploring ways to use journalistic-storytelling techniques to present a narrative for our advertisers." The new transparency in online publishing is something closer to translucency in which fine details are hidden. Mashable, for example, has a branded content team that serves as a liaison between the newsroom and advertisers. 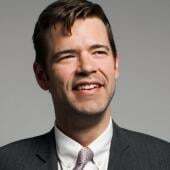 Adam Ostrow, the site's chief strategy officer, said the team gives potential clients a menu of stories and topics that its newsroom wants to cover, before the editorial staff pursues them. This list might include stories and their synopses or a general area of interest. For instance, Marriott paid for a branded series on the future of travel written by Mashable's tech editor, Pete Pachal. Editorial staff does not have direct contact with advertisers -- leaving that to the branded content team -- which Mr. Ostrow maintains helps protect newsroom integrity. The intent may not be to trick readers, but they're still feeling duped by sponsored content. According to an October 2012 poll by MediaBrix, a majority of people felt misled by some form of sponsored content online. In perhaps the most public outcry over this, readers of The Atlantic protested earlier this year after they felt misled by an advertorial on Scientology. The swift backlash was followed by an apology, a retraction of the sponsored post and, according to an Atlantic spokeswoman, a review of its advertising guidelines. "What magazine media sells is the relationship between the publication and readers," said Sid Holt, CEO of the American Society of Magazine Editors. "Fundamentally, what people are interested in when they look at magazine and magazine brands on digital platforms is the value and integrity of the content." Kelly McBride, a faculty member at journalism think tank the Poynter -- Institute, said publishers adopting sponsored content are not locked in a race to the bottom, but rather a race to profitability. "All of these new upstarts are just throwing out the rule book," she said. "Essentially, what the they're doing is starting from a new business model. The reason they can do that is because the old business model is dead. From a business perspective," she added, "sponsored content makes total sense." 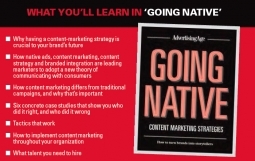 To purchase "Going Native: Content Marketing Strategies," please go to this order page.